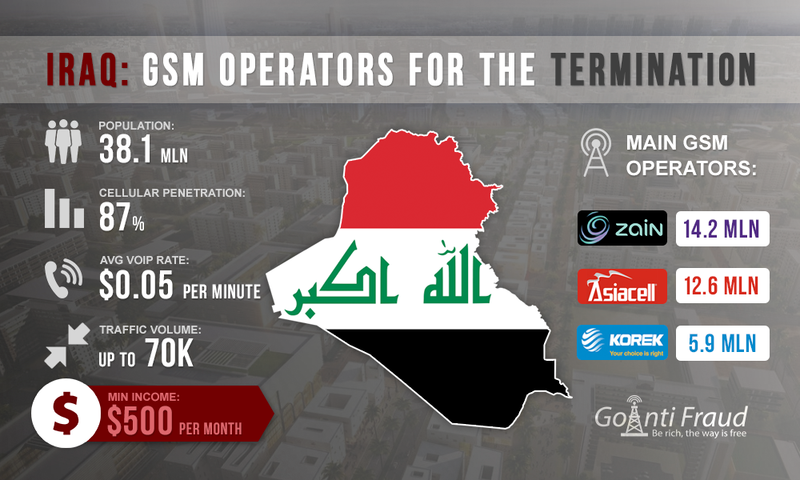 In contrast to the fixed wired communication, GSM communications in Iraq are sufficiently developed. About 33 million of the 38 million people living in this country use the services of mobile operators. GSM-penetration rate reaches 87%. The first two are competing with each other. Zain has about 142 million subscribers, while Asia Cell 12.6 million. Both operators cover 76% of the territory of Iraq. About 5.9 million people use services of Korek Telecom. From the viewpoint of the termination, it is important to choose the most suitable packages. To do this, take into account the cost of VoIP minutes, connecting conditions, coverage across the country, and so on. The most acceptable of all packages is the From 8 to 4 Cent tariff plan. The company creates new competitive tariffs for the residents of Al-Sulaymaniyah, Kirkuk, and Ninewa. Based on the average termination load, one minute of conversation will cost from $0.00034 to $0.00068. The only condition is mandatory top-up of $2.55 or more. Korek Telecom prepaid packages enjoy the success among the subscribers. This company is often mentioned on the forums as buy VoIP traffic in Iraq offers, or "provide the traffic for the final termination". When connected to a prepaid package of Korek Telecom, one minute will cost $0.000730. However, to use this tariff plan, you need to make a 500 dinar top up at least, or $0.42. And you need to replenish your account immediately after all the funds are spent. The average rate of a VoIP minute is $0.05. You can get about $300 a month via each channel while working 5 hours a day. To increase revenue, terminators can connect to GoAntiFraud. Its capabilities will help extend the lifespan of SIM-cards, thanks to the proven tools that circumvent antifraud systems. Using the service allows you to increase revenue from the termination a few times.